The eleven day Karaga festival worships water as the protector of life and culminates with a high energy procession. In 1983, United Nations Educational, Scientific and Cultural Organisation (UNESCO) declared April 18 as World Heritage Day to celebrate and preserve the shared heritage and history of the globe. On this day, countries around the world salute all that is left behind by generations before them for a continuity to their way of life. But 75-year-old Devendra S isn’t interested in global affairs. He is more worried about the fate of legacy his community has preserved for centuries now. Devendra belongs to the Thigala community – the keepers of Bengaluru’s oldest festival – Bengaluru Karaga. 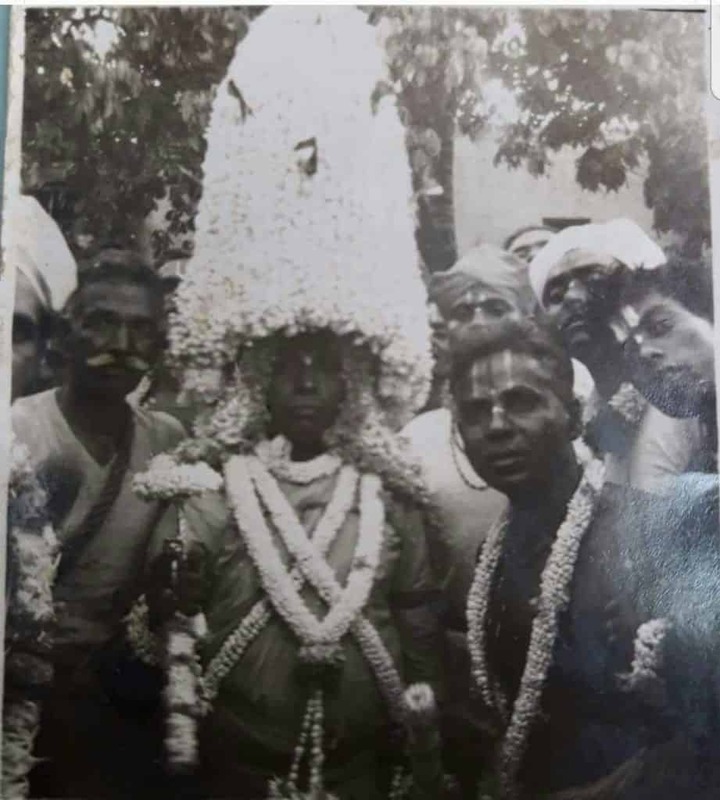 The pride of old Bengaluru, Karaga is famous for its high energy procession through the Pete area, with a man carrying the Karaga, camouflaged by flowers. His worry is palpable. “If we continue this callousness, there may be a day when we will wonder how we will celebrate the Karaga” he says. But Devendra isn’t referring to the drama that unfolded at this year’s Karaga, where the carrier of the Karaga changed at the last minute. It is more basic than that – the disappearing water bodies of Bengaluru is giving him sleepless nights. The status of Bengaluru’s water bodies has been a nightmare for many Bengalureans. Doomsday reports on how the city is running dry have us scrambling for solutions. But what does that have to do with a festival? “Karaga at the soul of it, is a water festival where we do the Gange Puje for eleven days. We worship Adi Shakti, the protector of life which is what water does in reality. Of the eleven days that it is celebrated, the Gange Puje, where we worship water bodies around the city is the main component. We have had to change the original spots of worship because the water bodies have been lost,” he says. The irony that Karaga worships water in a city that staring at water shortage and drought is not lost on him. But today it is impossible to do this. “The Kalyani at the sports academy indoor stadium premises is so polluted, that we order tankers, fill drums and then take the symbolic bath. We had built a small tank near the kalyani which could used for the bath, but even that is polluted. This is the case with most of other Kalyanis and ponds we used for pujas. There is a reason cities and civilisations flourished around rivers and water, because it gave us life. Is this how we protect it?” he laments. The community keeps the rituals of Karaga a closely guarded secret. “But if we don’t speak up now, we can’t protect this history. 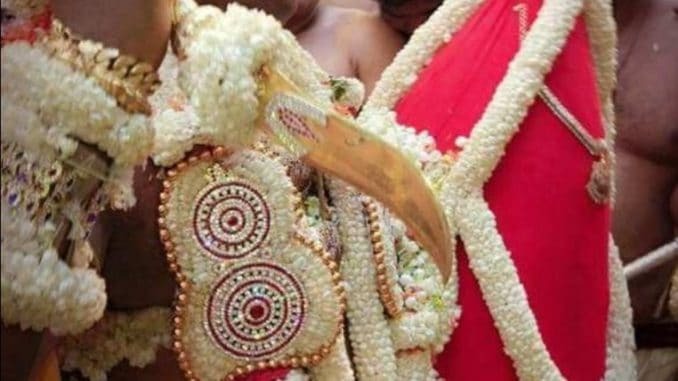 My aunt’s son carried the Karaga. My family still organises the first Gange Puje of the festivities. So it is a huge honour for us.” says Devendra. Another source of great pride for him is that the Dharamarayana Gudi, which is the epicentre of all the festivities, had never turned away anybody on the basis of their caste. “It has been a tradition in many Hindu temples which continues even today, that people have been turned away because they belong to the lower strata of religion. That has never been the case in Dharamrayana Gudi as far as I know. We have a great many customs that need to be protected,” he says. This is why the disappearing water bodies have left most of them in despair. The ponds and Kalyanis where the pujas happen around the city have now become bus stands, homes and markets if not open drains. The Karaga carrier traditionally bathed in the water of these seven ponds and wells before the puja at that location. The Karaga itself had water inside it from one of the ponds. A rare picture of the Karaga from 1923. Picture Credits- Selvamani, Department of Muzrai. The basic story of the Karaga stems from the Mahabharata, when Draupadi fought the demon Thimarsura. Her saree pallu comes undone during the battle and as she flips it, the veerkumars and gante pujaris are born, who the Thigala community believe are their ancestors. As the lady prepares to leave after the vanquishing the demon, they convince her not abandon them. So she promises to visit them once a year for three days and the Karaga has been the celebration of this promise since. The eleven Day festival begins with what the community call the ‘patta kurisdo’ in Kannada. A flag is hoisted to mark the beginning of the festival in the premises of the Dharamrayana gudi, the 1800-year-old temple built by the Ganga dynasty. The most important ritual is the erecting of flag pole which is a single bamboo which is called Pattada Maara. One family, which lives in the Jaraganhalli (the man wouldn’t reveal their identity) is entrusted with finding the greenest and sturdiest bamboo which is usually sourced from the Bannerghatta Forest. It needs to have 32 knots (markings) or more on it in an even number. They identify it a few weeks before, conduct pujas, before bringing it to the temple that morning. The flag represents Lord Krishna, who Draupadi had prayed for help. After a procession is taken out with the statues of Arjuna and Adi Shakti in the night, the Bamboo stalk that is brought in that morning is erected in the premises. The first Gange Puje happens at noon at the Karagada Kunte or Koti Bavi near sports academy in Cubbon Park. It was also called the Uppinaneerina Kunte because the water was salty and was massive water body that spread across acres at one time. Today you have look for it because there is no water, though the horticulture department maintains the surroundings well. Previously the water came to it through the kaluves which have now been built upon so there is no inflow of water. So a cement tank was built near it, to continue the tradition. The current BMTC depot near Shantinagar was once home to Ammachammana Bavi and surrounded by fields that was owned by members of the community grew vegetables. The Gange Puje on the third day would happen there. But since it was closed down, it has now moved to a place called Huvina Thota near Purnima Theatre. After that it goes to the Mahabaleshwara temple, before going to the Dharamarayana Gudi. Before it all turned into nurseries, Siddapura near Lalbagh was also filled with agricultural lands and wells to irrigate it. But as the city grew, this changed and now the Gange Puje of the fourth day is done at Mavalli. The Maramma Temple is where it begins before moving on to a well in a private house in the area to perform the Gange Puje. Mercifully the well is still full of water, says Devendra. On the fifth day, the Gange Puje is done at Gavipuram. The Khoday family which manages a kalyana mantapa in the area have maintained a pond, or a kalayani in its premises where the Karaga Gange puje rituals are allowed. The Dodda Annamma Temple opposite Kapali Theatre at Majestic used to have two or three ponds in its premises where Gange Puje was conducted. Today there nothing but a man-made cement tank with a tap. Devendra says: “Not much can be done. We can’t let go of our customs so we had to adapt. But it definitely hurts to remember the kalayanis that I had gone to as a boy during these prayers.” In the evening, the Aarti Deepa is conducted for the women of Thigala community at the Dharamarayan gudi. Since this is a festival celebrating divinity of women (though most of the rituals are done by men) there are a few worhsips that are entirely the ladies bastion. The Gange Puje is done at the Hasi Karagada Kunte again in preparation for the evening when the Hasi Karaga actually happens at around 3 am in the morning. This is one of the most protected secrets of the Karaga though there is a crowd of thousands who gather to see it. A pot of water is brought to the temple from here, decorated with a red cloth and kept at the Dharamrayana Gudi which eventually becomes the Karaga. There are many legends associated with the ritual. Some say that at one time, the pot contained water from the seven kalayanis and kuntes where the Gange Puje was done. “But if we were to follow that today, all the water comes from tankers, so we may be getting it from just one source,” laughs Devendra. They also have another ritual called “gaavu hidiyodu” which is a symbolic ritual of sacrifice (not an animal sacrifice) to ward of evil spirits. The Mariswamappa Mutt at Kalasipalya which now houses the new vegetable market is home to the family to who Pehlwan Lakhman and Narayana belonged to. They organise the Gange Puje at the Mutt which has a well in its premises. The Puje happens under the Sampige tree in the premises. Then they head to the Muneshwara Temple which is also in Kalasipalyam. This space holds a special space in the community because all the last rites for Thigalas after a death are conducted here. The Gange Puje is back again at the Hasi Karaga Kunte for the third time in the morning. 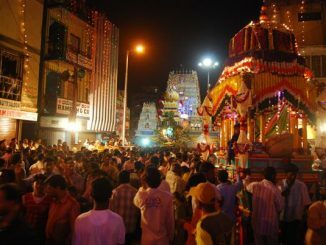 In the evening is the main Huvina Karaga procession. So Gange Puje is very special that day. “The reason we go there three times is because it is the doorway to the city through which Adi Shakti came to us. It is a called oorina bagilu. It is the most sacred spot for Karaga and we go back there before before the main procession of the night that most people come to see,” says Devendra. The procession goes on till the wee hours of the morning before the Karaga returns to the temple having gone through the route where it visits temples and a mosque en-route. The Huvina Karaga goes on till the wee hours of the morning and returns to Dharamrayana Gudi before sunrise. (The controversy this year over the change of the Karaga bearer was amplified because the Karaga started at 3.45 am and could not complete the journey before the sun rose). After the procession is done, the community then ends it with “gaavu” or sacrifice that starts on Day seven. There is a Vasanthothsava that follows that evening. As the eleventh day begins the flag that was erected on day one is lowered signalling the end of Karaga. Through human history, cultural heritage belonging to many communities are entwined with the living heritage around them. Before civilisation happened and taps and electricity invented, generations of people worshipped elements of nature as polytheists. So in a city like Bengaluru where, the administration has been less than careful with its living heritage of trees and water ways, the Thigalas and Karaga let us know it is not our survival at stake. It is what makes us human – our civilisation that we stand to lose. Somebody please tell this to our governments? The annual Dharmarayana Karaga procession is happening on April 3rd and 4th. Here are the traffic diversions in place. Deepika Nagabushan attended the Karaga festival that took place earlier this month. And finds out why it is not considered ‘a place for women’. Brilliant piece of history, untold, not taught anywhere in schools. Thanks for writing this!